A cute Golden Lion Tamarin clings to a tree in the Tropical Forest at the Biodome de Montreal in Montreal, Quebec in Canada. This small furry little animal that resides in the Tropical Forest at the Biodome de Montreal in Montreal, Quebec is a small New World monkey known as a Golden Lion Tamarin. This species of monkey is highly endangered as there are only about one thousand of them left in the wild and places in captivity like the Biodome de Montreal have a total of about five hundred worldwide. 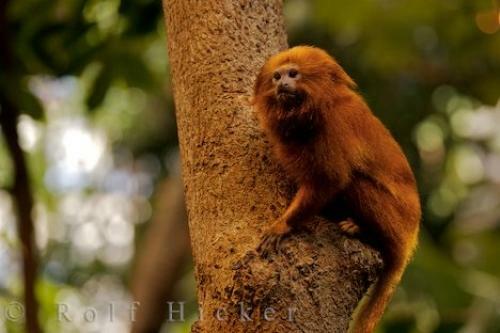 When looking at this Golden Lion Tamarin, you can see that its name is appropriate as the fur around its face, neck, throat and cheeks is much longer than that on its body. They possess colours of either reddish orange or golden brown with long slender legs and long claws at the end of each foot. Photo of a Golden Lion Tamarin in his habitat in the Tropical Forest at the Montreal Biodome in Montreal, Quebec, Canada. The Tropical Forest at the Biodome de Montreal has recreated the habitat of the Golden Lion Tamarin to ensure that they feel at home. They can live for about fifteen years in captivity and you can sometimes hear sharp cries coming from them as they climb and feed in the Tropical Forest at the Biodome de Montreal. I photographed this photo with the digital SLR camera model Canon EOS-1Ds Mark II, aperture of f/5.6, exposure time of 1/200 sec. on ISO 800, as always I used a original Canon Lens, the focus lenght for this picture was 170mm.